Ski Guide Tim Dobbins breaks down exactly what he keeps in his pack. 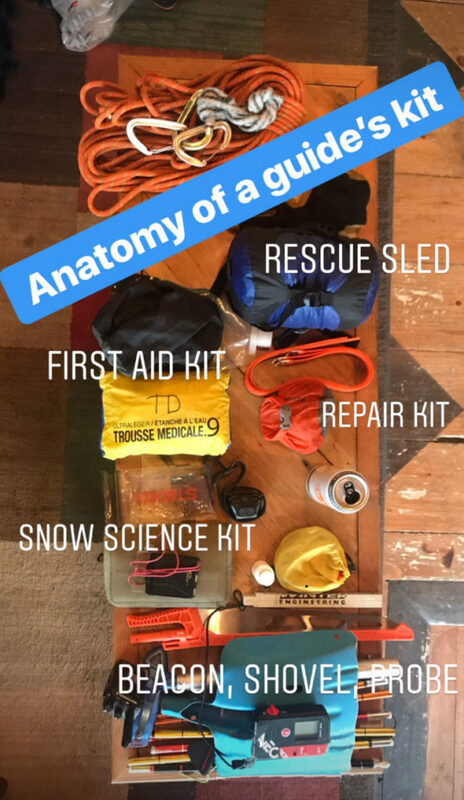 As part of the AIARE 1 Avalanche Course that he teaches, Tim always gives an overview of all the essentials that guides carry with them for a day in the field. With a little ingenuity and the right ingredients, a guide can build an emergency shelter or rescue sled with these must-have items. Rescue Sled: My favorite is the Alpine Threadworks Sled. It’s a rescue sled and an emergency shelter in one. You can also quickly velcro it in half and use it as a temporary shelter to get out of a storm. The key is incorporating multipurpose items into your kit. Repair Kit: My repair kit has duct tape, a pipe clamp, a couple zip ties, a multitool with different screwdriver heads, a small pack of random screws for ski/splitboard bindings (splitboards seem to come apart all the time! ), some Allen wrenches, a lighter and a firestarter. First Aid Kit: Pretty self-explanatory, my kit includes all the basic stuff: band-aids, crevates (cloth for slinging and swathing), blister care, gauze, a pressure bandage, and some painkillers like aspirin and ibuprofen. A 30-meter rad line, carabiners and a dyneema double runner: Again, everything we carry has to be a multipurpose item. For example, if there is an injury, you’ll be able to build your rescue sled with these materials and you’ll be able to drag it behind you. If someone lost a touring skin, you could wrap the line around a ski, strap it on and get some traction so you could travel out of there. If you needed to belay someone through uncomfortable or exposed terrain, you could tie a quick bowline in the line and sling it around their waist and get them through the difficult section. Food & water: For any normal ski guiding day, I bring at least a liter of water, and more than that if I’m touring in the spring. Then, I always mix in an electrolyte hydration powder. For food, I like to carry real stuff like meat, cheese, and nuts. As a backup, I always have Shot Blocks and Gu on hand if a tired client starts to bonk in the skin track. Headlamp: this is crucial. It’s a no brainer to have a light source (other than a cell phone) but many day-trippers choose to forgo it. Especially in unfamiliar terrain, a headlamp can make the difference between an unplanned winter bivvy and making it back to the car. Snow Science Kit: My kit includes a field notebook, a crystal card, x10 loupe (for magnifying), a thermometer, TWO mechanical pencils, and a compass with declination. The data you can collect with these tools is always appreciated by the Sierra Avalanche Center, even if you don’t know how to interpret it, simply sending in photos of the data you collect can be helpful. Tim Dobbins using an Ortovox terrain tool to teach a group of AIARE 1 students about slope angles, wind-loading and how to choose terrain wisely. Q: Tim, this looks like an awfully BIG PILE OF GEAR. Why should people bring all this stuff? Tim: If you’re going into the backcountry, you need to commit to being as autonomous as possible. You should be prepared to be totally self-reliant. Before straining the resources of Search and Rescue, you should be ready to take care of your own problems and be prepared to evacuate with a plan B if your equipment should break down miles from the trailhead. Having this gear on hand could prevent a bad situation from getting worse. Q: Does every backcountry skier or splitboarder need to bring ALL these items? Is there a minimal version of this guide’s pack for a recreational backcountry skier/splitboarder? Tim: Honestly, I wouldn’t want to tell them anything less, some things are essential! A first aid kit for sure, a rescue sled for sure, a headlamp, a repair kit- that’s going to keep you from having to walk all the way out… BUT that doesn’t mean you can’t split up the gear amongst your friends’ packs. There are two categories: personal gear and group gear. Obviously, your beacon, shovel, and probe is personal gear. On the other hand, for the group gear, there are a lot of things that you can share out to keep your pack weight down. These items include the first aid kit, rad line, rescue sled, carabiners, double runner, and repair kit. But don’t get too excited about having a light pack, because if you’re a ski guide, you’ll be carrying everything yourself! Q: Tim, how long have you been ski guiding? 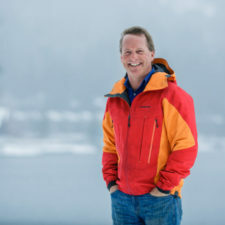 Tim: I have been guiding for 9 years, and I’ve been a certified American Mountain Guides Association Ski Guide since 2014. I am an IFMGA aspirant mountain guide, and AIARE level 1 course leader. Q: What’s your favorite spot to ski? Tim: Anywhere that has good snow! You can have the best terrain in the world and with bad snow, it’s not a good day. But, if all goes according to plan, interior BC, specifically Rogers Pass. 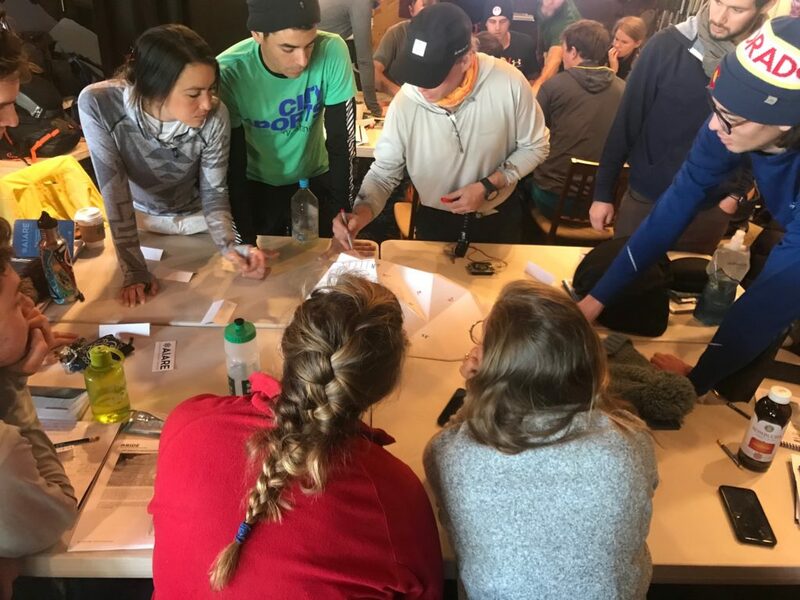 Tim has recently spent the last 9 years guiding and instructing in rock, ice, alpine, and skiing as well as becoming an IFMGA aspirant mountain guide, an AMGA certified ski guide and AIARE level 1 course leader. He lives on Donner Lake in Truckee with his wife Gisele, sweet daughter Manue and newborn Matisse.